1. Explain the Punishing Kids story to another student. 2. What does corporal punishment mean? 3. How has the way students are disciplined changed over the years? 4. Corporal punishment is illegal in Australia. True or false? 5. What are Kevin Donnelly’s views on corporal punishment? 6. Do you agree with his views? Explain your answer? 8. Do you agree with her views? Give reasons why or why not. 9. What do you think are fair consequences for kids who misbehave? 2. What protective clothing do you need to wear if you are handling bees? 3. What do the bees collect to make honey? 4. Where is the nectar stored to make honey? 5. It’s thought that the pollination done by bees provides about a ________ of the world’s food. 6. The Varroa mite has spread to Australia. True or false? 7. Why are beekeepers worried about the Varroa mite? 8. Why do the kids in the BtN story like beekeeping? 9. Why is it important to protect bees? 10. Create a facts chart about bees and beekeeping. Take a look at the bionic eye app to simulate the sort of vision a person with a bionic eye might experience. 1. How long has Jessye been blind? 2. How does she get around? 4. 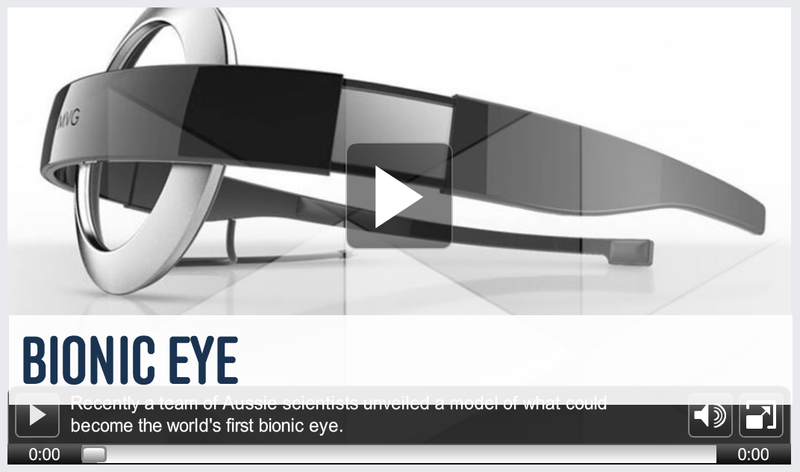 Scientists hope the bionic eye will help around ____% of people to see. 5. What is the cochlear bionic ear and how does it work? 6. Choose three adjectives to describe how Sophie felt when she could hear and speak for the first time. 7. 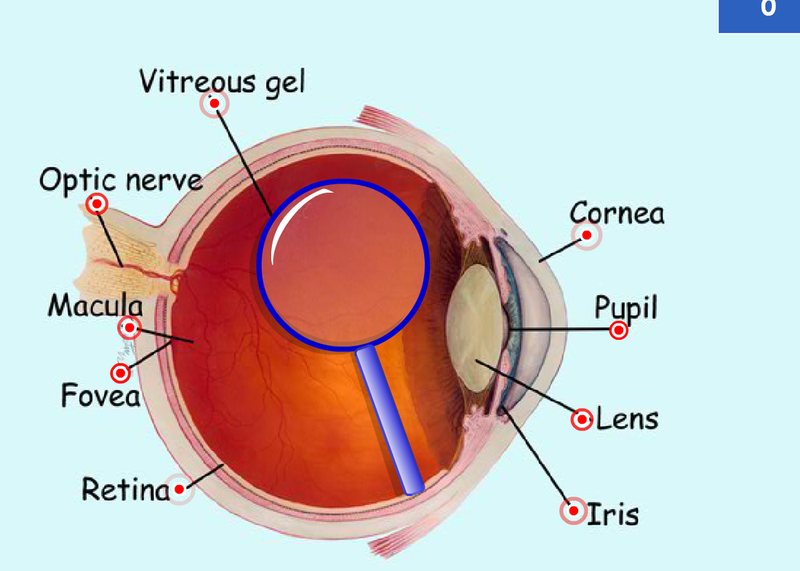 What job does the retina perform? 8. 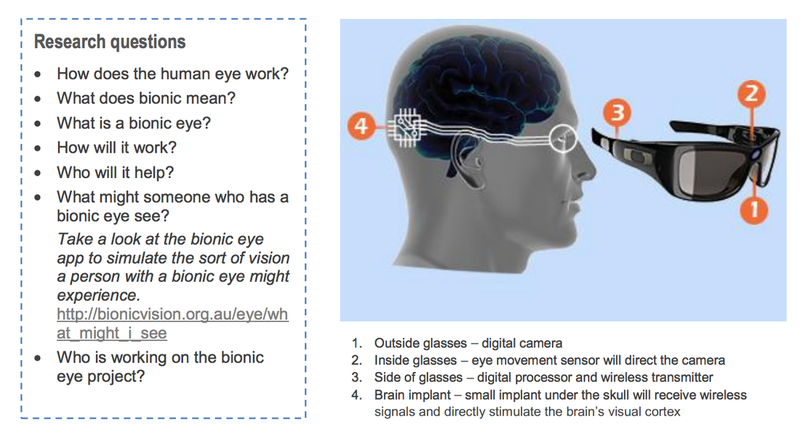 Using words or pictures, describe how the bionic eye works. 9. 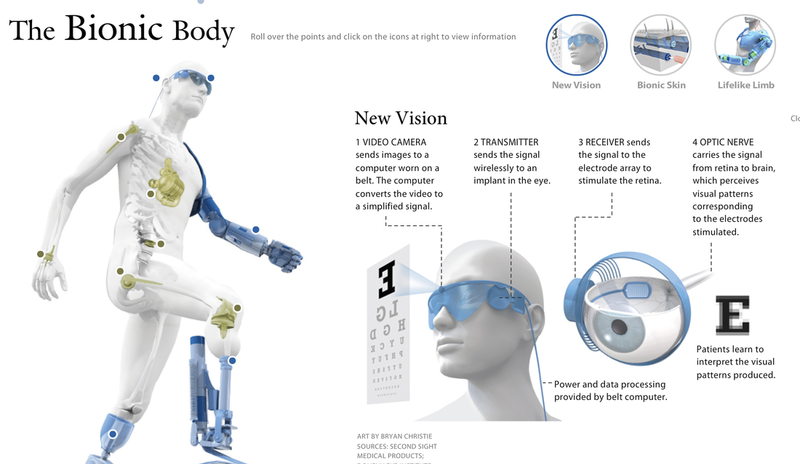 Describe the images people would see with the bionic eye. 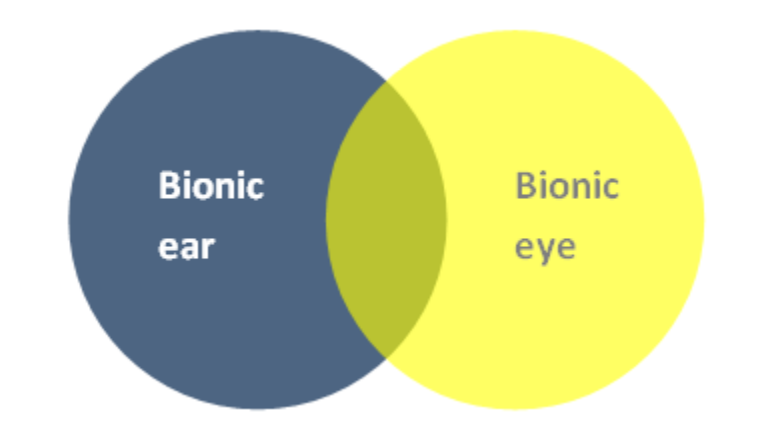 Complete the Venn diagram below to show as much as you know about the bionic ear (also called a cochlear implant) and the new bionic eye. Remember to use overlapping parts of the diagram to show what they have in common. 1. Which state has recently introduced a shark culling program? 2. Why was the program introduced? 3. In your own words, describe what a cull is. 4. 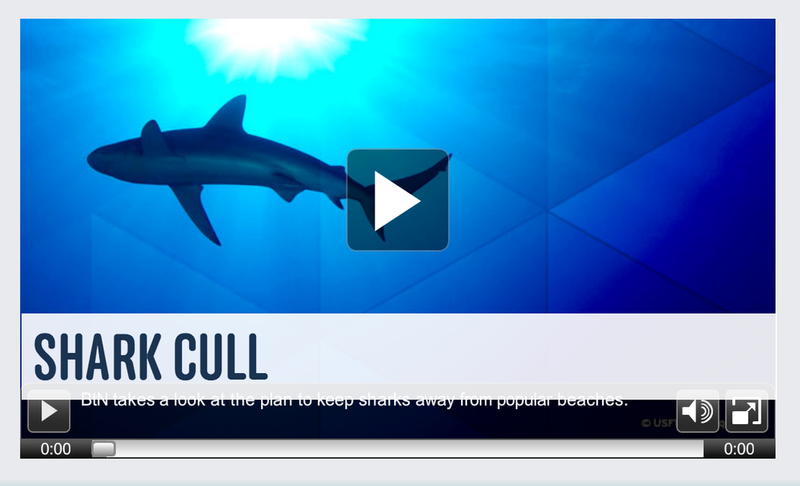 What is the aim of the shark cull? 5. Which species’ of sharks can be killed? 6. How long do the sharks have to be? 7. Give one argument for and one against culling sharks. 8. Do you think that the shark cull will make the beach safer for people? Why or why not? 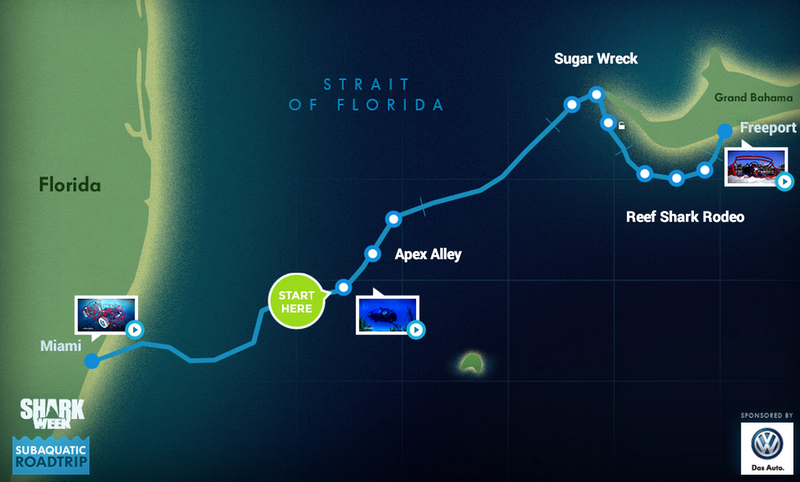 Go on a virtual shark dive. REPORTER, JAMES BARTOLD: When it comes to things that we’re scared of, sharks are usually pretty high up on the list. Although they’re terrifying, shark attacks are actually pretty rare. But they do happen and when they do they’re big news. Over in Western Australia seven people have died from shark attacks in the past three years. The rest of Australia doesn't even come close to that number combined. So the WA government decided they needed to do something about it quickly. Their plan was to catch and kill the sea giants if they come too close to the beach. To do this they set up shark 'no go zones'. These areas are surrounded by special hooked called baited drum lines. Sharks that go into these areas are seen as a threat and can be caught and killed. The problem is many sharks are endangered species so not all of them can be killed. They have to be either Great White, Bull or Tiger Sharks, and they must be bigger than three metres long. Government spokesperson: “Seven people dying in three years is a lot and we believe the government had to do something about it”. On Australia Day the first shark was caught entering a no-go zone. The 3metre shark was caught south of Perth and later killed. That made a lot of people very angry because not everyone agrees that killing sharks is a good idea. They argue that sharks are an important part of the ecosystem and, rather than killing them, we should learn to live with them. Sharon is one person you'd probably expect to support the new plan. Her son Kyle was killed by a shark in 2011. His death was one of the cases that brought about the new policy. But she doesn't support it at all. Sharon Burden, Shark Attack Victim's Mum: “You can't just say, ‘we’re going to kill things because it interferes with my lifestyle,’ and, essentially, that's what's occurring here. Not all shark attack victims agree though. Brian's another Aussie who's come face to face with a shark. He disagrees with Sharon and says it's time to take action. "There's no such culling. This is all about safety of people in the water". So that's the argument for and against the culling of sharks. But what do you guys think is right? Kid 4: I reckon maybe they just kill some of the sharks, some of the main ones, but keep some as well. Kid 5: People are not going to want to swim if they know there's gonna be sharks that will come and eat them"
Five things more deadly than sharks.